Ojay Harris of Martin Luther King High School finishes first in his heat of the unified division 100-meter dash at the PIAA state track and field championships. Ojay Harris is still undefeated. Even on a blistering day with little cloud cover and temperatures tickling 90 degrees, nothing could dim his shine. When last we left Harris, he had just completed his senior year of football at Martin Luther King, where his diagnosis of autism hadn't stopped him from being the best offensive lineman on a team that won a Public League playoff game. Saturday afternoon at the PIAA track and field championships at Shippensburg University, Harris, who was diagnosed in third grade, won his heat in the 100 meters of the unified Special Olympics event. "I had a lot of nerves when I first walked on the track, but I stayed composed, stayed calm, and once the gun hit I had to do what I had to do and took off running," Harris said. "I did pretty well. I was the first one to make it there. I feel pretty great." Four years earlier, the Martin Luther King physical education teacher watched as kids competed in the Special Olympics during the PIAA track finals at Shippensburg. King, she said, previously had a soccer team and a few other sports for kids with special needs. "But I said, 'Wow, how can King be a part of the Special Olympics in track and field,' " Johnson said. So she made a few calls. As a result, this is the first time the Public League has sent a unified team to the state championships. Athletes from Martin Luther King High School, including Harris (far left), stand together following the unified division 100-meter dash at PIAA state track and field championships. Mike Bovino, senior advisor for the Special Olympics of Pennsylvania, said this is the fourth year a state champion was decided. Athletes with and without disabilities, he said, are on unified track teams together and train and compete with and against each other based on similar abilities. "It's all about removing labels and looking at the athletes themselves," he said. 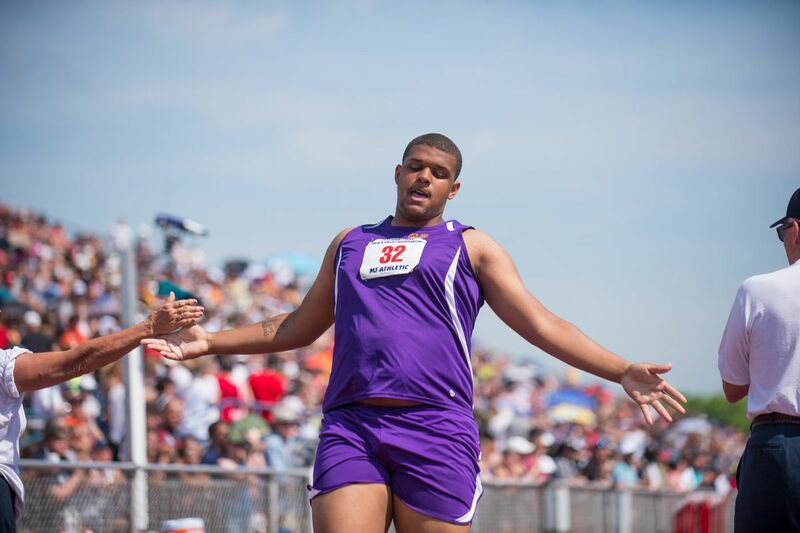 Friday afternoon all eyes were on Harris, who hurled the shot put 46 feet, 6 inches — the farthest distance in the event. Next year, Harris will use a different kind of might. His eligibility in football has been exhausted, but he will stay at King as a student and be a coach on the football team. Johnson said Harris has already taken a leadership role with his teammates on the track team as he did on the football team last season. Harris also plans to go through the testing process again to gain admittance into Thaddeus Stevens, the two-year technical college with a football team that showed interest in him as a player. Until then, Harris has a message for other kids on the autism spectrum and anyone who might doubt them or him. "I was just like guys who have autism and got teased every day in elementary school because of my size and also my autism," he said. "But I stayed strong. I told myself, and I'll say it again, I'm a fighter. I fight through this all the time. I told my coaches at school, 'I'm a fighter. Autism will never stop me.' "